Twin sisters Ariane and Chloe come from a family where only their mother speaks Mandarin. 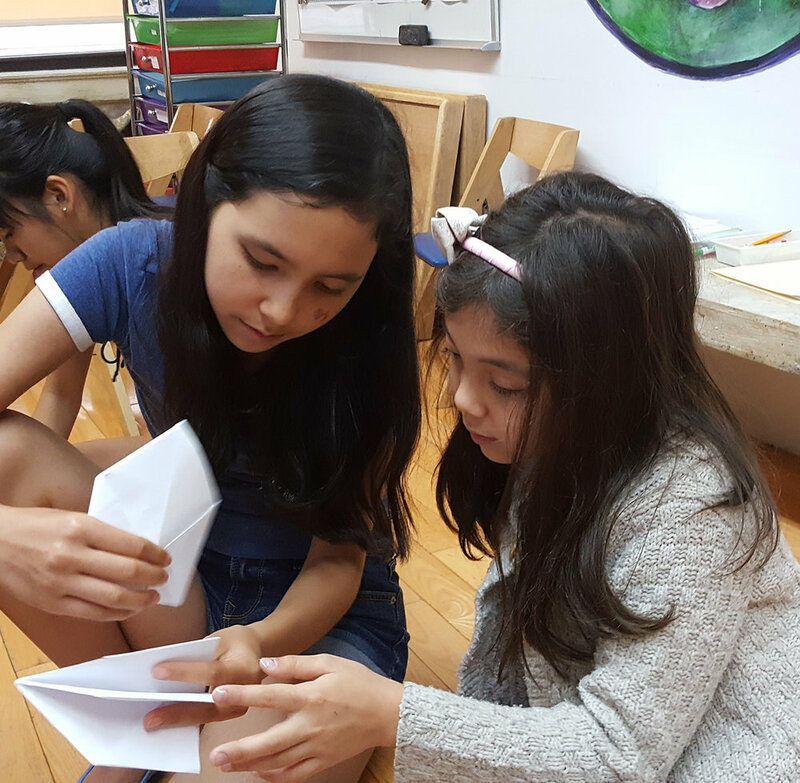 They joined CCBG in pre-K. Now 9th graders, Ariane and Chloe speak fluent Mandarin, read and write in Chinese to study Chinese geography, history, art and culture. Having a full-time Mandarin-speaking nanny from pre-K to 8th grade. Taking advantage of their advanced Chinese study with CCBG, Ariane and Chloe have been studying Spanish in middle school. In high school, they plan to pick up another foreign language — Latin. Mei comes from a household where only her mom speaks Mandarin. Mei joined CCBG in Kindergarten. Now a 11th grader, Mei speaks fluent Mandarin, reads and writes in Chinese to study Chinese geography, history, art and culture. She has started to realize and become proud of the fact that Chinese has been, and will always be part of her life. Having a part-time Mandarin-speaking nanny from birth to age 4 and speaking to her mom using partial Mandarin. Upon entering 6th grade, Mei wanted to take Chinese class at her school. However, she was deemed overqualified for the curriculum. So, Mei picked French instead her foreign language at school, becoming trilingual before college. Sabrina comes from a household where only English is spoken. However, her family has a rich multi-cultural background and a deep appreciation of cultural and language diversity. 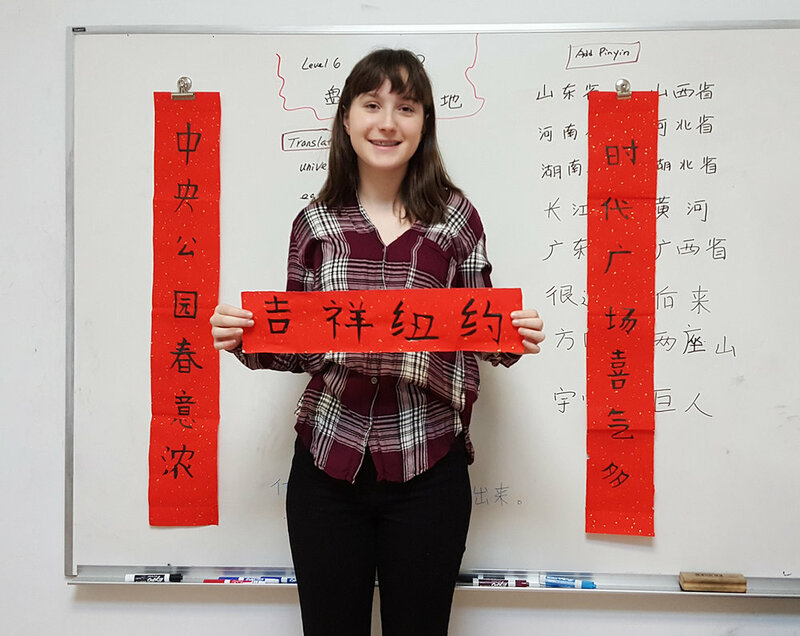 Now, as a 9th grader, Sabrina converses in Mandarin, reads and writes in Chinese, and is eager to further her Chinese proficiency. Sabrina joined CCBG in 3rd grade. Since then, every Saturday morning, she travels all the way from Queens to CCBG's Manhattan classrooms to take her Chinese classes. She has moved up from CCBG's Level 1 curriculum to the advanced Level 6. Sabrina traveled to China with the CCBG Summer China Program. She followed the footsteps of the Tang monk, Xuangzang, and learned about how China once thrived by connecting to the outside world through the Silk Road. Now, Sabrina is a freshman at a Mandarin-English bilingual high school where she is well on her way to exploring the many doorways that have opened for her. Zoe comes from a household where only English is spoken. Zoe joined CCBG summer camp in 1st grade. Now a 12th grader, Zoe speaks, reads and writes Mandarin like a native. Working as a staff assistant in the CCBG 2018 Summer Program China. Zoe's strong bilingual skills, hard-working and fun spirit have made her a valuable member of not only the CCBG community but any community she is involved in.